In the new world of work, the HR professional is a storyteller. He or she must now be competent in the creation of communication strategies that will not only enlighten employees but enable them to carry their organization’s story to potential candidates -- and all external audiences. HR’s ability to be effective marketers, and to tell their organization’s story through various channels, requires excellent communication skills and the ability to articulate their organization’s “voice” and to rally the employee advocates internally and externally to build engagement with prospective candidates. The future of “HR MarComm” is increasingly focused on communication personalization and engagement. How are you communicating and engaging with your internal and external audiences? Please join @shrmnextchat at 3:00 p.m. 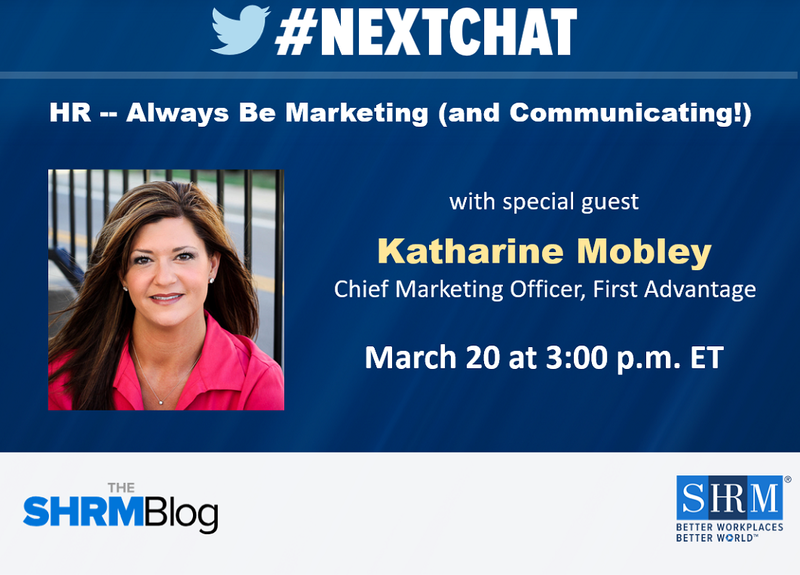 ET on March 20 for #Nextchat with Katharine Mobley (@KatharineMobley). We’ll chat about how HR can think and strategize like marketers and build communication strategies to establish a voice and tell their stories to aid in building their brand and accomplishing their goals. Q2. What tools can HR professionals leverage from marketing’s toolkit to make their jobs easier and more effective? Q3. What are some tips for how HR can achieve buy-in, whether it’s from current employees, potential employees or the community at large? Q4. Where do you think organizations are encountering the biggest challenges with workplace communication today—whether internally or with talent acquisition efforts? Q5. Message tone is critical whether communicating externally to prospective candidates or employees. What advice can you share with HR for determining how to set the tone for these workplace communications? Q6. What HR technologies do you see as having the most positive influence today on HR’s internal and external communication efforts? Q7. Analytics are important for measuring the impact of marketing and communication campaigns. Which communication and marketing metrics should HR be paying attention to and why? Q8. What advice can you share with HR professionals for how they can better collaborate across the organization—especially with marketing and communications departments?